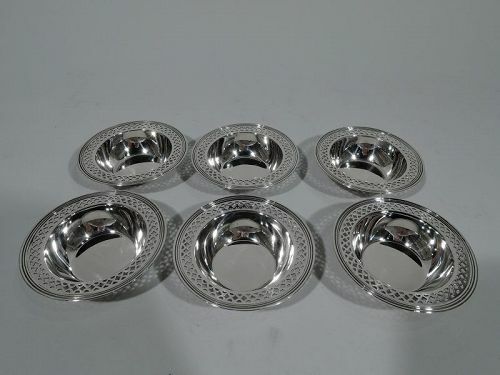 Stylish sterling silver wine bottle coaster. Made by Tiffany & Co. in New York. Solid well with fluted and radiating leaf and dart ornament. Open sides with blocks comprising pierced scrollwork and flowers. 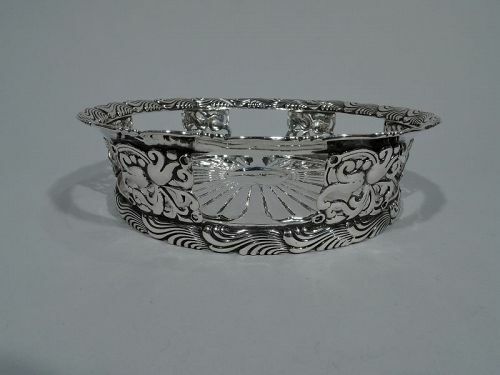 Flared rim with chased and fluid wavy band. Same on base. This pattern sometimes called Wave Edge. Perfect for a single-bottle night. Hallmark includes pattern no. 9057 (first produced in 1886) and director’s letter M (1873-91). Very good condition. 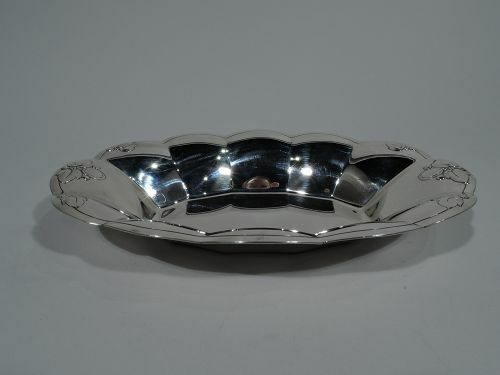 Fancy sterling silver page turner. 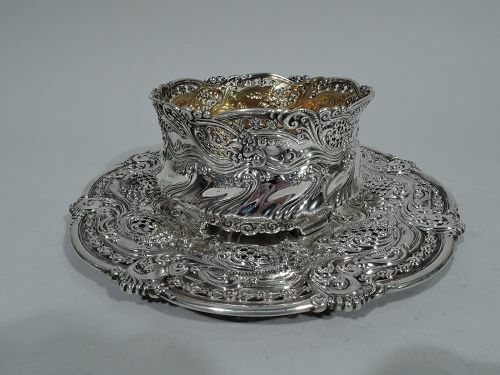 Made by Shiebler for Tiffany & Co., both in New York, ca 1900. Plain blade surmounted by dense and textural leafy scrolls. Shaped end handle with open kidney. 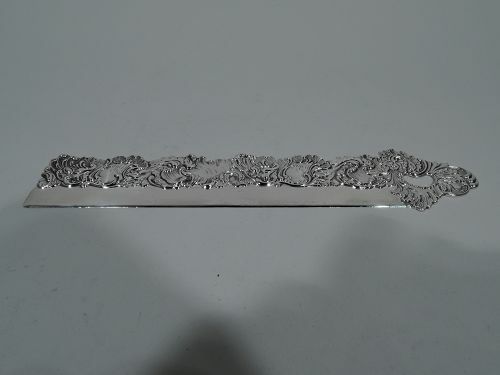 On back is engraved ruler measuring nine inches. Exuberant and practical. Fully marked including maker’s and retailer’s stamps. Numbered 3699. Very good condition. 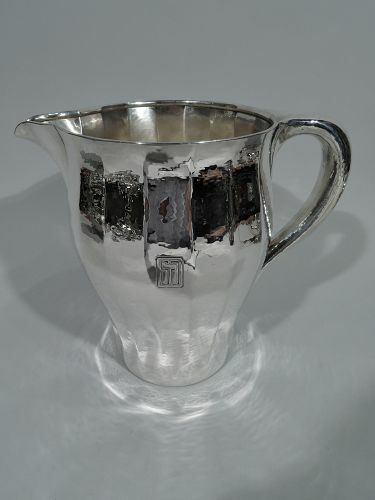 Craftsman hand-hammered sterling silver water pitcher. Made by Tiffany & Co. in New York, ca 1909. Softly faceted baluster with v-spout and c-scroll handle. Nice rippling shimmer. Rectangular frame with two-letter monogram. Fully marked including pattern no. 17580 (first produced in 1909), director’s letter m (1907-47), phrase “Special Hand Work”, and volume (5 1/2 pints). Fine condition. 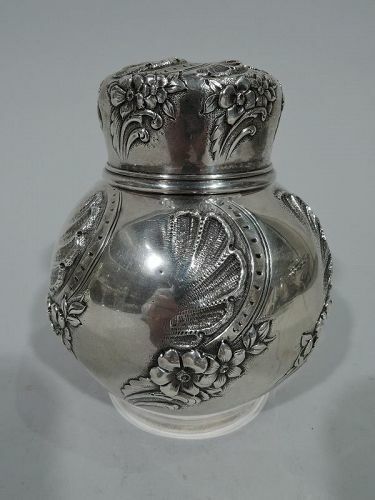 Neoclassical sterling silver ginger jar tea caddy. Made by Tiffany & Co. in New York. Twisted ornament with flowers, pointille scrolls, and scallop shells emerging from plain ground. Hallmark includes pattern no. 4824 (first produced in 1877) and director’s letter M (1873-91). Very good condition. 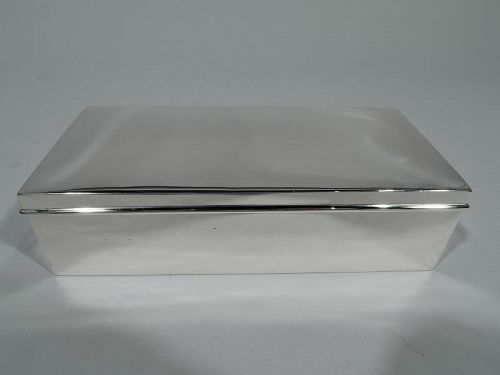 Modern sterling silver box. Made by Tiffany & Co. in New York. Rectangular with straight sides. Cover hinged and gently curved with molded rim. Box interior cedar lined. Cover interior gilt-washed. Hallmark includes pattern no. 18495 (first produced in 1913) and director’s letter m (1907-47). Very good condition. 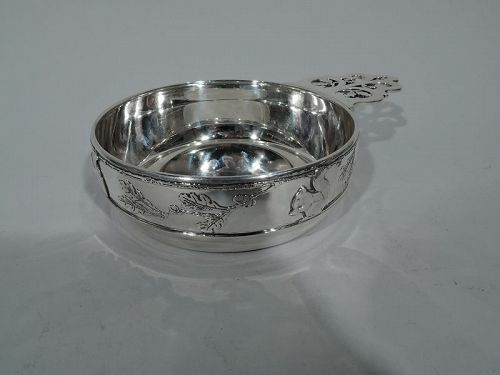 Sterling silver bowl in classic Clover pattern. Made by Tiffany & Co. in New York, ca 1910. 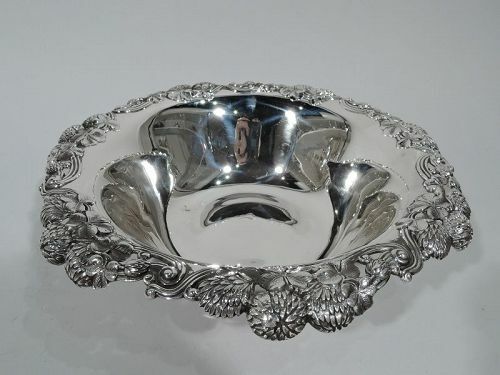 Tapering sides and turned-down rim with bunched blossoms. An early piece in this Gilded Age high-low pattern that combines wild flowers and precious metal. Hallmark includes pattern no. 13780 and director’s letter m (1907-47). Very good condition. 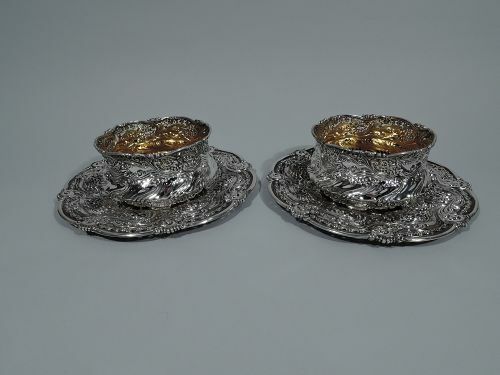 Neoclassical sterling silver tea set. Made by Tiffany & Co. in New York, ca 1910. 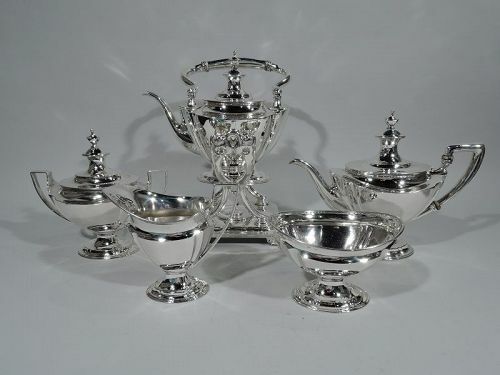 This set comprises hot water kettle on stand, teapot, creamer, sugar, and waste bowl. All: fluted and tapering ovoid body on raised oval foot. Covers double domed with vase finials. Handles scroll bracket except kettle which has swing scroll handle. Kettle stand square with corner paw supports.